MINNEAPOLIS, MINN., – How can anyone stressed out in these difficult times learn to calm down? A Minneapolis law firm, an artist and a doctor might have the answer. Taking a holistic and totally innovative approach to improving business practices and the health of its attorneys, the Minneapolis law firm Parsinen Kaplan Rosberg + Gotlieb P.A., (PKR+G www.parlaw.com ) recently turned to art, meditation and science to understand if the calming “nature” paintings by renowned artist Joan Solomon (www.joansolomon.com ) could impact productivity and help increase profitability by providing stress relief. First reactions to the study at the distinguished law firm ranged from skepticism to intrigue. But in the end art proved triumphant through science. 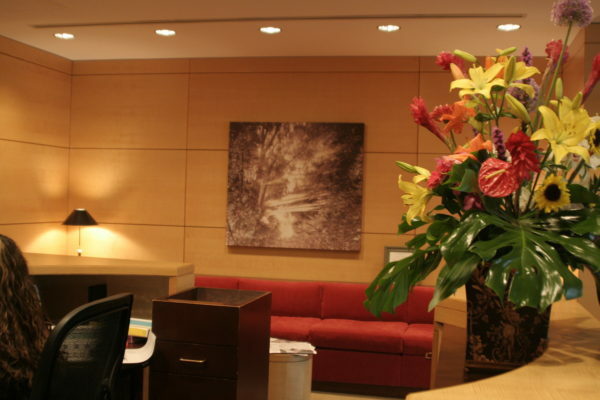 After 60 Solomon paintings and 40 prints -some have been described as containing “worlds within worlds” and “healing works of art” – were hung throughout the PKR+G offices, the study focused on how stress and adrenal function were affected by art through an “Art Calm” relaxation/meditation technique devised by the artist. 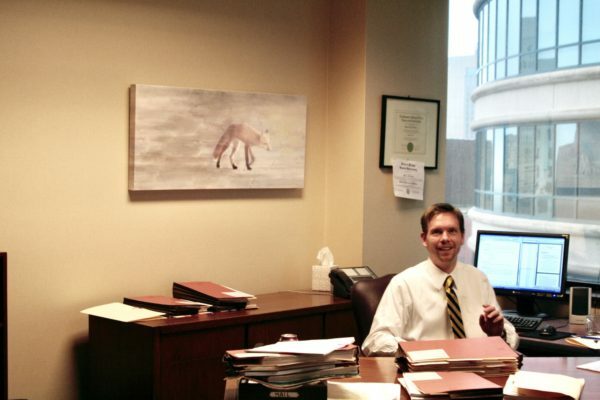 The 18 participating attorneys who engaged in the process each selected a painting for their office, and four times a day, with the ringing of a Zen bell through their computers, they then were asked to spend 10 seconds or more in Art Calm mediation while gazing at the paintings. The unusual experiment was overseen by Robert Bruley, MD, DC, of The Bruley Center (www.bruleycenter.com) in southwest Minneapolis. Dr Bruley is a graduate of Mayo Medical School, holds a degree in chiropractic from Northwestern Health Sciences University, is board-certified in holistic medicine and specializes in Integrative and Functional medicine. According to Bruley, the collective and individual results showed a marked improvement among those studied. It also demonstrated the benefits associated with meditation and, in this case, the power of Solomon’s paintings to inspire more peaceful, healthier states, based on key factors such as blood pressure and adrenal functions. 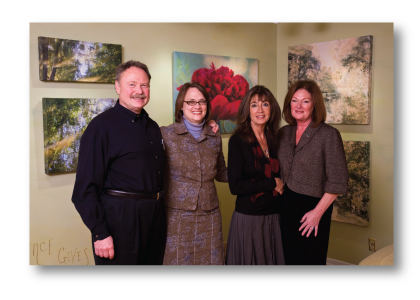 “The benefits of the experiment were clear from the very beginning,” notes Mary Kay Ziniewicz, PKR+G Marketing Director “We saw attorneys stepping out of their comfort zone and into an artist’s studio to connect with art. They learned about themselves and their colleagues. Clients and staff gained insight into the sensitive side of their legal counsel and conversations took place that would not have otherwise taken place. This isn’t the first time Solomon’s mystical art that is gently centered in the natural world has been put to the test in real world settings. 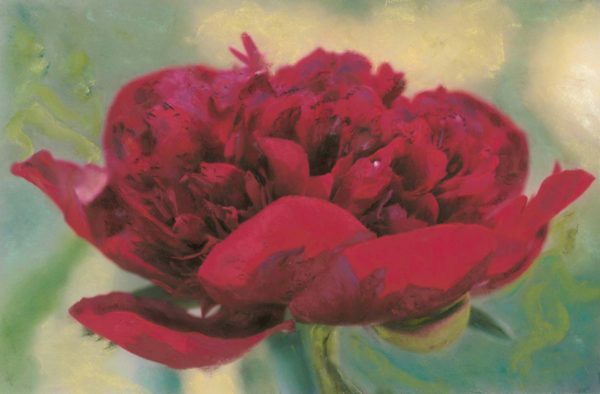 Her visionary work is often found across the country in clinics, nursing homes, healing centers – and among a growing number of savvy, international collectors. Solomon, a former senior-level professional from the advertising and branding worlds, began spontaneously painting 20 years ago and had no formal training as a painter.